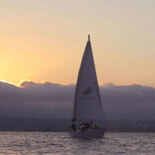 Experience San Diego right on the Bay while relaxing on a sailing excursion with San Diego Sailing Tours. 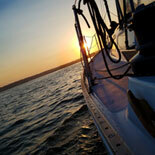 This 2 hour tour cruises near Point Loma, Coronado, and Downtown San Diego. Let the wind and the sea take your breath away as you take in the local scenic view and wildlife. Watch the setting sun dip behind Point Loma an cast it’s colorful rays across the sea. 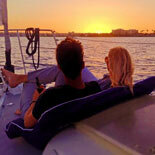 Cruise the Harbor and watch a sunset aboard a classically restored yacht. Intimate group, no more than 6 passengers per charter. Views of Downtown, Point Loma, Harbor Island, Shelter Island, and Coronado Island. 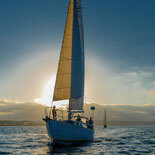 Experienced skipper for a safe and smooth sailing experience. Tasty selection of cheese, salami, and crackers served onboard. 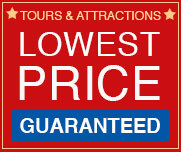 Our tours host up to 6 passengers, including children, creating an intimate group experience. There is always a chance of seeing natural wildlife such as seals, sea lions, and dolphins. Our captains offer first class service by providing refreshing beverages and snacks, with your first glass of wine or beer as complimentary. While on your journey, be sure to ask your Captain about the local history and their expansive sailing knowledge. Sail abroad one of five gorgeously restored luxury sailing vessels. As you cruise the harbor, admire the vessel’s characteristic mahogany and teak woodwork, classic lines, and distinctive interior design that is no longer seen in today’s production. Our yachts are restored by our own crew, most of them built right here in California. Stretching 36 ft. in length, you have room to relax, walk around, and find the perfect spot to enjoy your cruise. Create the memory you’ll never forget on San Diego when you make your reservations and get your eTickets Today! Reservations must be made 48 hours in advance. E-ticket will contain complete details regarding this tour. Cabrillo Isle Marina- 1450 Harbor Island Dr., San Diego, CA, 92101. Between the two Sheraton Hotels, across the street from the San Diego Airport. Limited paid parking spots available at the Marina. There are no age restrictions on who can come sailing, children under 13 will be required to wear a life vest. 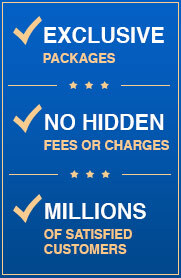 Children are considered a passenger, and must have a ticket purchased. No persons under 21 will be served alcohol, but are still welcomed.